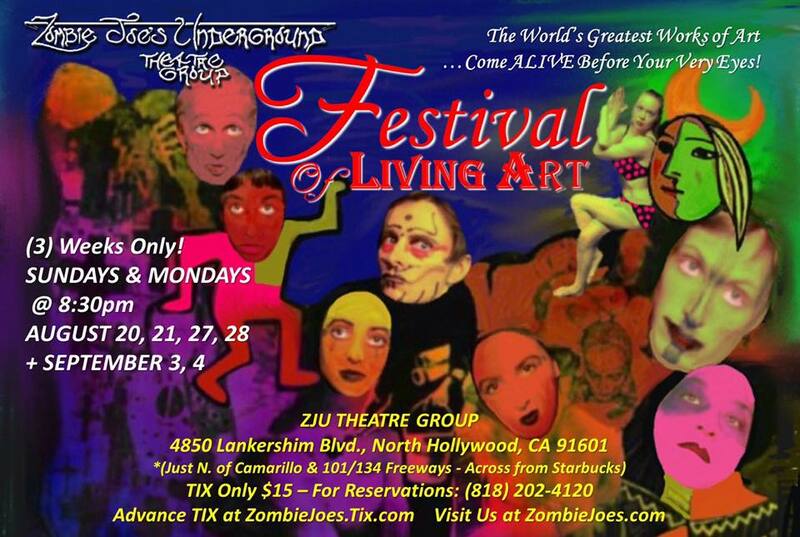 Zombie Joe's in North Hollywood is celebrating its 25th year--an impressive achievement for any theatre company. One reason for that lies with a willingness to experiment and take chances. 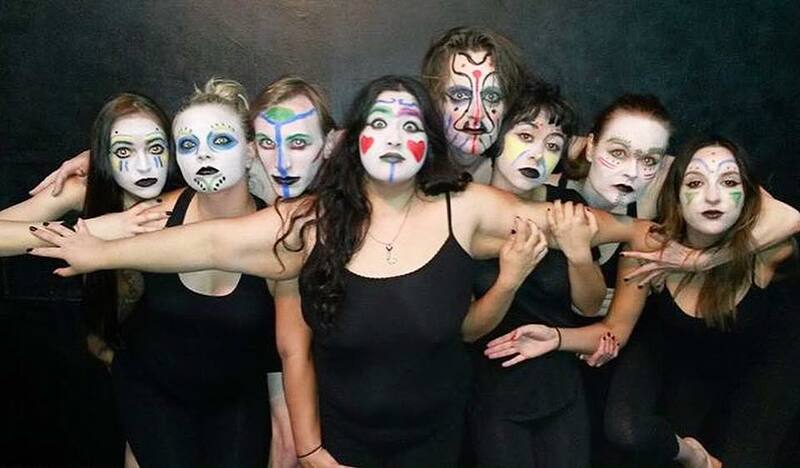 Festival of Living Art is hardly a unique idea--a series of tableaus, actors recreating famous works of art. Nor however is it terribly common. The logistics of doing it frankly seem daunting! All the more impressive when you get to actually see it carried off! A figure. Or a set of figures. Honestly since the performance lasted an hour I don't remember them all. 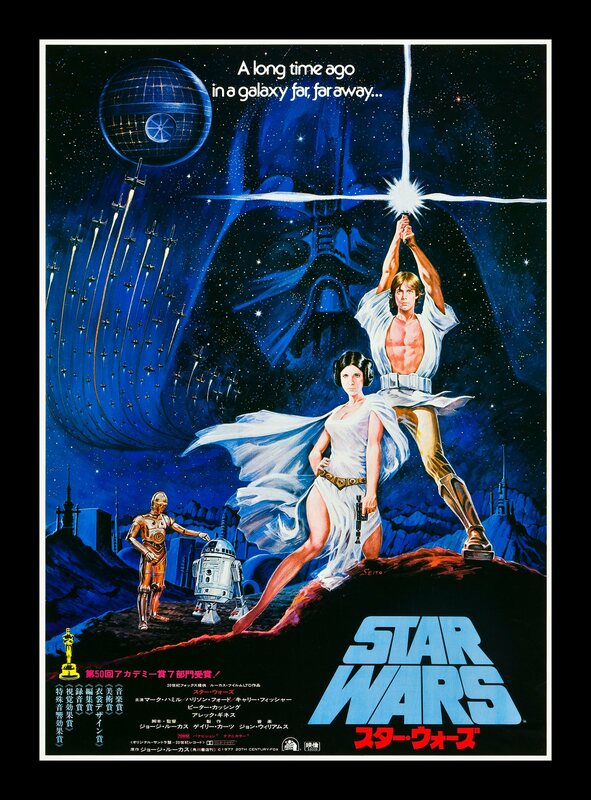 But I remember experiencing this living slideshow--images from famous works of art, including pop art like the original Star Wars poster--just appearing out of the darkness. Or Botticelli's Birth of Venus. A famous propaganda poster from World War II. 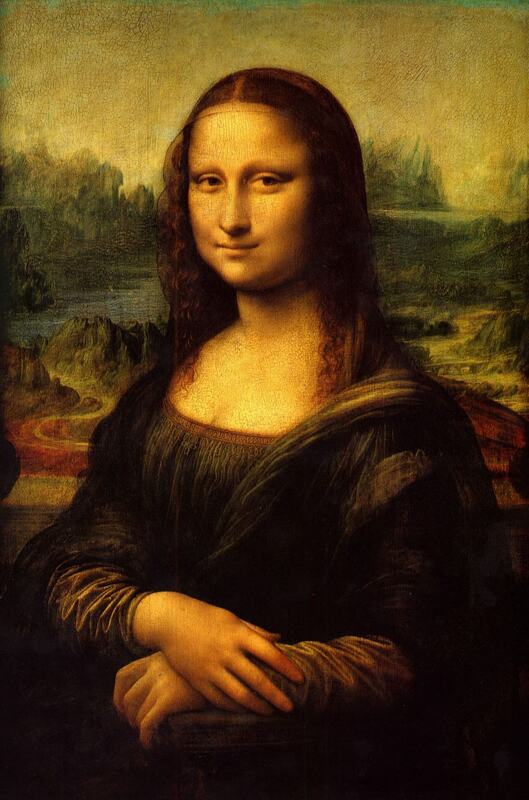 Mona Lisa as well as Dante and Virgil in Hell and the glorious sculpture of Eros and Psyche. And Liberty Leading the People. It sounds so simple. Yet in truth it feels very much the way you imagine a really good art gallery visit should feel. Because the light comes up suddenly, you get fierce flash of the image. It almost hits you, and as the darkness returns an afterimage remains in your eye. Instead of trying to recreate each work perfectly, the ZJU crew goes for an essence. Be it Kimpt's The Kiss or Picasso's The Old Guitarist, for a few seconds the broad strokes of these masterpieces suddenly...breathe. And the effect does more than charm. It enters like a taste of cold, crisp, and fresh air. 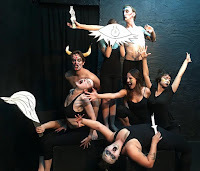 Kudos to the whole cast: Charlotte Bjornbak, Susan Marie Chambers, Gloria Galvan, Brett Gustafson, Ian Heath, Esther Lane, Carson Frae Meyer and Cara Rosselot. 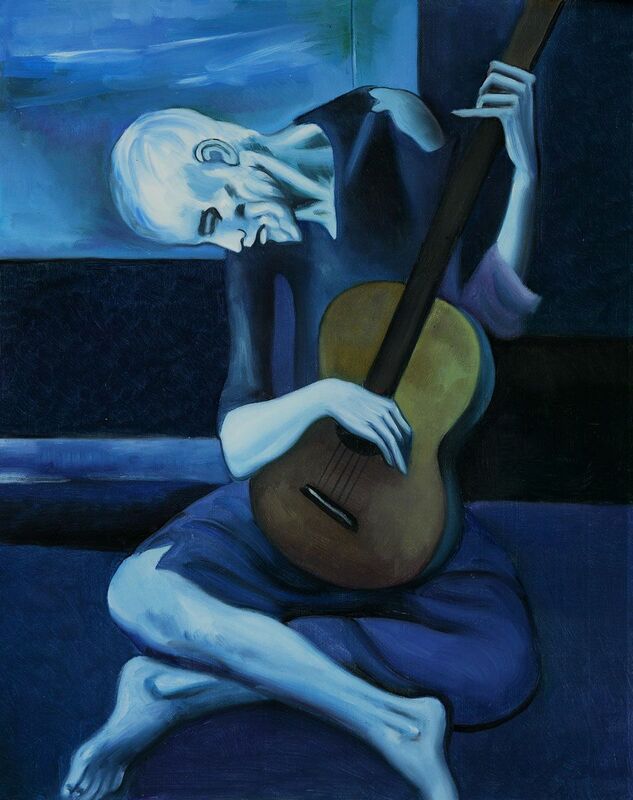 They create in that single hour a fascinating look into art, into the media of both painting and theatre, and as a result into the visceral nature of simply experiencing the world. 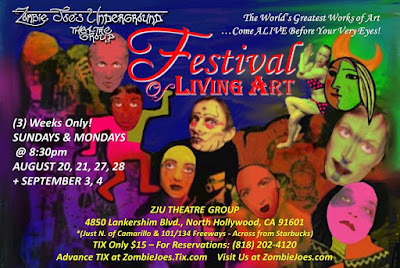 Festival of Living Art plays Sundays and Mondays at 8:30pm until September 4, 2017, at Zombie Joe's Underground Theatre 4850 Lankershim (just south of the NoHo sign), North Hollywood CA 91601. 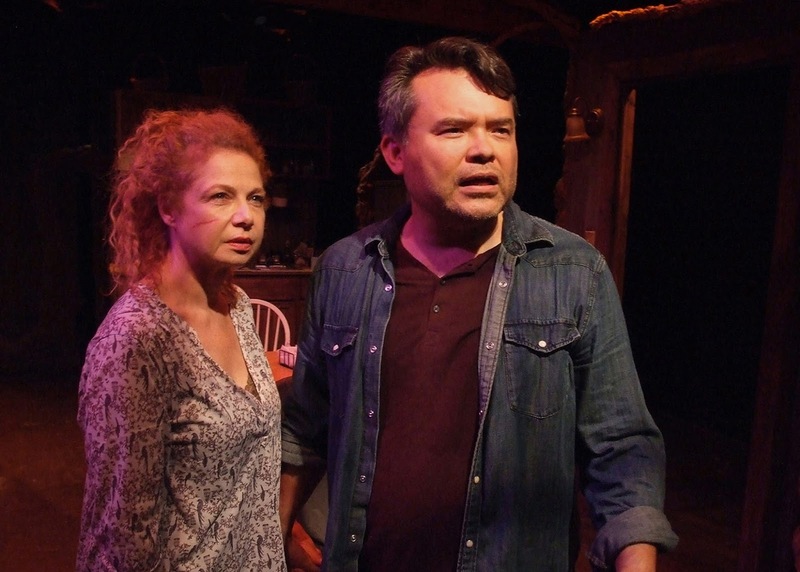 In a cabin in the woods, an estranged husband Daniel (Peter James Smith) and wife Ann (Addie Daddio) meet to clean out the place before they sell it. Seven years have gone by since they were last here. Seven horrible years since their child disappeared and the accusations began, the press, the court dates, the suspicious police, the hatred from total strangers. Seven years since their lives were destroyed when their beautiful child vanished without a trace. Today would have been her birthday. 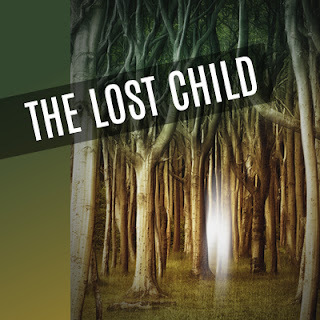 She of course is the subject of The Lost Child, by Jennifer W. Rowland. Her name is Angelica (Marilyn Fitoria) and the story really takes off when she re-appears. Eleven years old, exactly as she was. The fact she refuses to explain only makes things worse. Ann and Daniel have had seven years to let their desperate imaginations run wild. Now events stranger than they'd ever thought possible start to mount up. It brings out the best and worst in them. 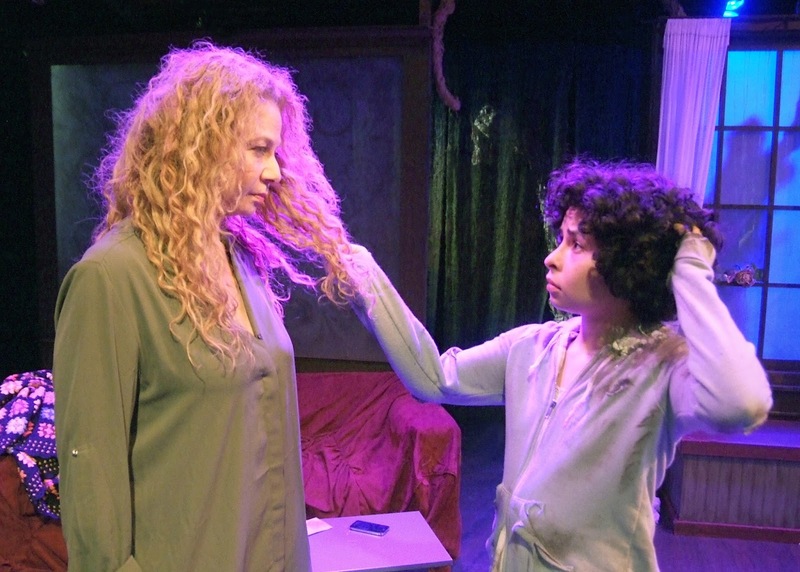 Suspicions about each other boil to the surface in the wake of Angelica's baffling refusal to explain what happened. Reactions to their child increasingly acting like a teenager, but with far less restraint than most, only heighten the tension. When answers do come, they seem unbelievable! The play essentially is a retelling of an archetypical myth. Someone goes to the land of Faerie and returns years later, even though for them it has hardly been any time at all. Here Ann and Daniel try to wrap their heads around an answer that gives zero comfort, can give none. The brutal truth is, the universe is beautiful and wonderful--but not kind. Which deals with the content of the script. Scripts consist of mere words without the actors bringing them to life. Here the three member cast does a fine job, in particular cycling between familiar habit and brain-aching attempts to make sense of what is happening. It hurts to watch sometimes. More it hurts to see Angelica try and explain to them, explain why she was so happy in that other realm where there was no time, no emotions, no pain and no (as it turns out) compassion. Like very small children the "Good Folk" are heartless. And Angelica, as she cycles through puberty now that her body has returned to space and time, she shows the worst of herself just as her parents do. Because we're not that compassionate either. At heart here is a story about the uncanny, and its wondrous but devastating impact. We know the parents will remain haunted for the rest of their lives. Maybe, just maybe, they will grow into wisdom. Angelica, she will not. Nor will she need to. Honestly I wish there were more to this. But also honestly, I have trouble seeing how there could be more. So I am left thinking and wondering, which has got to be a good thing, yes? The Lost Child runs Fridays at 8:30pm and Sundays at 7pm until September 3, 2017 at the Skylight Theatre (next to Skylight Books) at 1816 1/2 North Vermont Avenue, Los Angeles CA 90027. 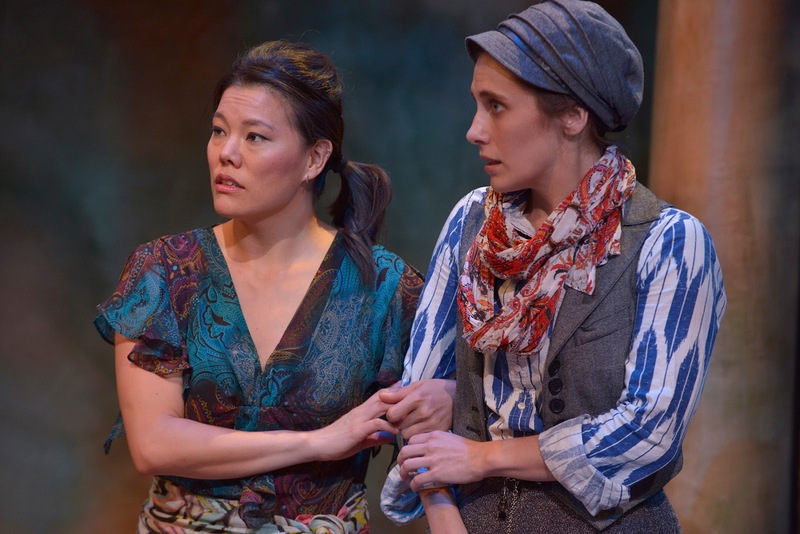 Although an early work, Shakespeare's As You Like It (now showing by the Anteaus Theatre Company) proves surprisingly tricky to pull off in tone. Maybe because its genre--pastoral romance--has pretty much vanished. Or perhaps the complexity of the work simply exists, confusing some actors and directors. But pulling it off does evoke some real wonders! braham) who is Rosalynd's uncle. 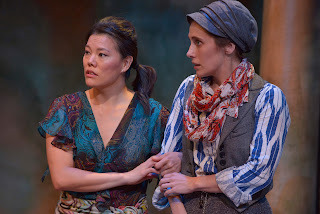 So disguising herself as a boy, Rosalynd flees the court with the Duke's daughter Celia (Desiree Me Jung), who is her best friend, along with local Jester (J.D.Cullum) into the Forest of Arden where all the exiles hide out. Orlando follows, unknowingly, meets Rosalynd-as-a-boy and does not recognize her with gentle merry mixups ensue. Along the way, lots more couples hook up. I mean a lot! 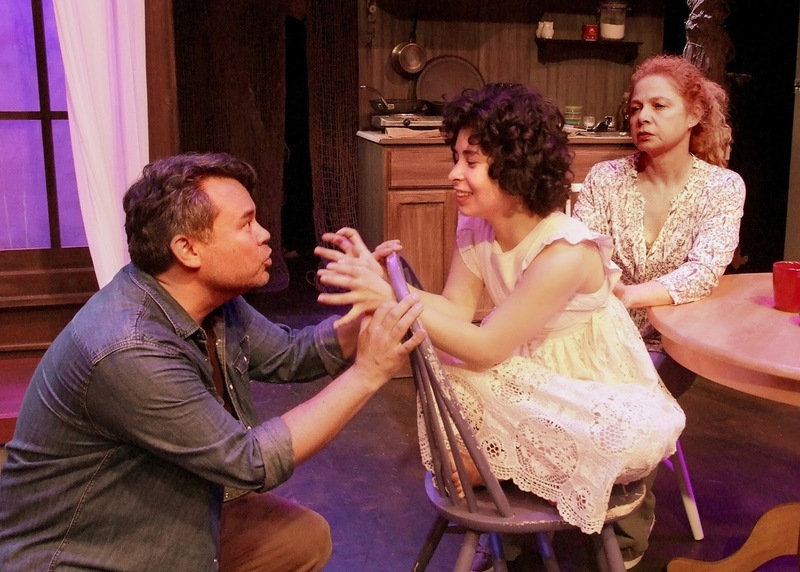 What makes this play so special, or so it seems to me, is how in the midst of the pastoral setting and silly goings-on, the hearts and lives of the characters remain vulnerable, tender, filled with hope and fear. "Oh what fools these mortals be" says another character in another play, but how appropriate for this one! Because we are fools. All different kinds of fools. In the silence of the woods, maybe we can realize that, and in the process find some peace. Even love. 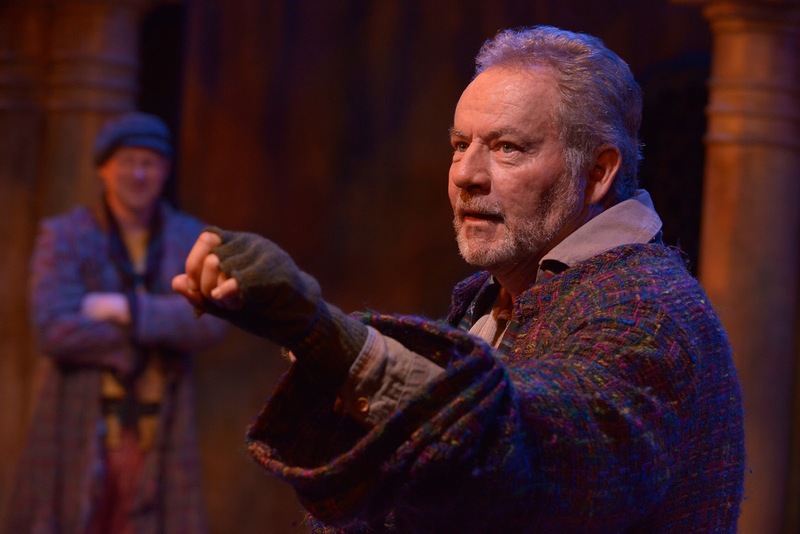 Many productions of As You Like It seem to rise and fall on the portrayal of Jacques, a melancholy scholar turned wanderer who gives the plays' most famous speech. "All the world's a stage" he says, "the men and women upon it merely players." Such a witty line! Such a clever speech! But fueled by a sad kindness, at least when done for full effect as James Sutorius does in the role. Truly, he does a magnificent job, because he does more than make you laugh, he makes you think and in thinking maybe makes you start to cry. Nor is he alone! Because the story of the entire cast is like that. Everybody does foolish things, brave and sometimes wonderful or dangerous acts--many at exactly the same time! The world changes. We change. We cannot help it. 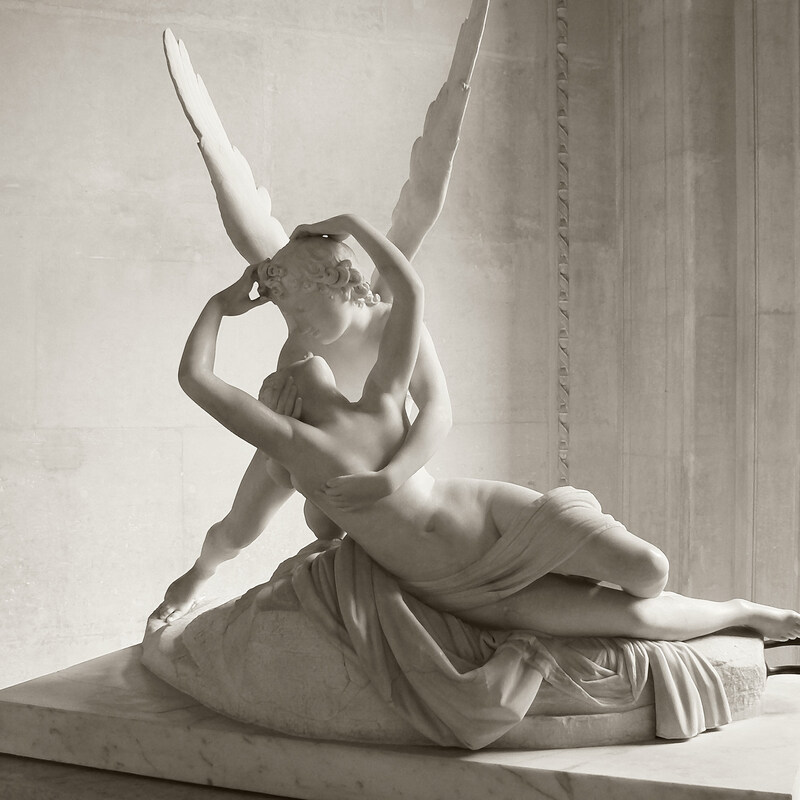 And even that most delightful of changes--to fall in love, and be loved in return--how can it not inspire terror? So maybe the Forest of Arden is perfect place to flee! Hence this idyllic setting, and the gentle poking at all the flaws of humankind, exposed by a terrific cast of actors under some exemplary directing by Rob Clare. Too often productions focus on the frenzied gags and hurrying to the next set piece of humor. But we laugh all the harder when we care. And we do. Because when we care, we need to laugh. As You Like It plays Fridays and Saturdays at 8pm as well as Saturdays and Sundays at 2pm through September 10, 2017 at the Kiki & David Grindler Performing Arts Center, 110 East Broadway, Glendale CA 91205.